The United Kingdom has over 23 million registered vehicles on their roads and like Malaysia they’re citizens love to use buy special registration plates for their automobiles. While some of the number plates issued in the United Kingdom’s DVLA offer interesting combinations, there are also many potentially offensive registration plates that are banned by Britain’s Driver and Vehicle Licensing Agency (DVLA) and cannot be issued as a registration number. Let’s take a look at the United Kingdom’s number plate system and the numbers that where recently issued banned plate list issued by the DVLA. Britain’s DVLA plate number series is currently made up from combinations of 7 letters and digits, this system has been in place since 2001. 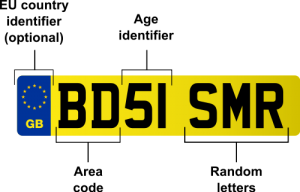 The first two digits of the number plate represent the area code of the DVLA location where the automobile was initially registered. The next two digits (age Identifier) represent the year that the automobile was registered, in the second half of the year, the DVLA does something funny with the age and adds the value of 50 to the registration year. The last three letters are random and are by far the easiest process to explain. Below is an example license plate which was registered in Birmingham during the second half of the year in 2001. Many of the banned number plate combinations in the UK need a little help from ones imagination. In almost all of the instances, a number is understood be act as a letter, for example the number one most often represents a letter “I”, a number “6” is used to represent the letter ‘g”, and a number “4” is used as a letter “L”. While many of the personalized plates are clearly in poor taste we find it interesting how some words are banned while others are not. It is worthy to point out that the DVLA has 46 pages of personalized plates that cannot be issued due to either religious or cultural sensitivities. One interesting contrast in the ban is the allowance of the plate KR15HNA, (the Hindu god Krishna) which sold on auction for £233,000, while both JE55US and AL14AH are banned. The license plate MO14MED ,will be allowed in 2015, the registration of MO14MED is expected to fetch more than £100,000 at auction, Interestingly, the license plate combination 15LAM is banned. Below is an explanation from the DVLA, in regards to how they determine a banned license plate combination. Registration numbers are withheld in instances where if displayed on a number plate they are likely to cause general offence or embarrassment. Even though their is currently 46 pages of banned number plate combinations in the UK, they still added more than £105million to there treasury from the sale and auction of personal registrations. Click on the link to view a PDF of the 46 pages of banned number plate combinations.